The Internet has become a decadent smorgasbord for online gamers and with so many rival brands striving to create the next blockbuster game, software developers have to stay ahead of the pack. Players have come to expect a certain level of quality and graphic engagement if a game is to be deemed worthy of their valuable time and money and perhaps no one understands that better than Rabcat. Rabcat is new on the scene so the game catalogue isn’t as vast as other more established brands, but the dedication to drool worthy graphics and attention to detail has already set a new bar for the competition. A recent partnership with the bee’s knees of gambling software, Microgaming, means Rabcat’s incredible slot games can now be found at leading online casinos like Royal Vegas Casino and Slots Million. Try these popular Rabcat pokies for free or real money bets today for a sign of the upwards direction the casino software industry is heading in. Rabcat was established in Vienna, Austria in 2001 where the brand started out by creating premium game art services for console video games like Xbox. Producing high-end 3D interactive gaming content, Rabcat quickly earned a name for itself, racking up multiple awards including placing sixth on the 2009 list of Austria’s best start up entrepreneurs. Over the years the company has collected a very impressive list of clients, including big names like Atari, Rockstar Games, Microsoft Game Studios, Disney Interactive Studios, Climax and Deep Silver. Along with creating real-time video game content, Rabcat extended its services to include iGaming, becoming a leading manufacturer of premium casino game applications for the online gambling industry. It didn’t take long for Rabcat to secure a partnership with QuickFire, giving the Rabcat brand a giant boost and helping to establish a global presence thanks to QuickFire’s firmly cemented portfolio of online casino operators and partners. Towards the end of 2014, the biggest move came when Rabcat announced it had signed a deal with Microgaming to exclusively supply games to Microgaming’s group of operators, with Rabcat titles now accessible from all the best Microgaming powered casinos. Online punters can now access Rabcat’s superb pokies creations using downloaded casino software or Flash and HTML5 powered browser based casinos. Rabcat still operates out of Vienna with a small studio of around 30 employees, but as Microgaming is arguably the most trusted and respected name in casino gaming software, it’s safe to say that Rabcat has a very fruitful road with plenty of room for growth ahead. As a relatively new start-up, the Rabcat casino game collection is still small, but what the game catalogue lacks in quantity, the games certainly make up for in quality. Each game in the handful of Rabcat pokies titles is exquisite, providing some of the most graphically engaging slots available anywhere on the Internet. If high quality graphics and engaging animation is your thing, we recommend you give all of the Rabcat games a try, with games available in instant play mode using your web or mobile browser at Royal Vegas Casino and Slots Million. Each of these casinos uses the latest in digital SSL security encryption to ensure players can gamble safely and securely. Players receive full support and deposits are accepted using a range of secure payment methods. Rabcat games can be played for free in demo mode if you want to get a feel for the game first, but we highly recommend players register for an account at these casinos to stay up to date with Rabcat game releases as they become available. 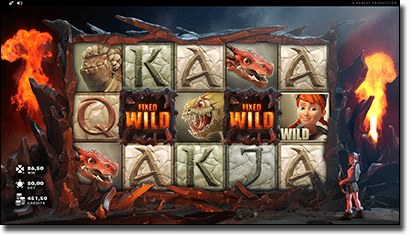 With games like Castle Builder, Forsaken Kingdom and Dragon’s Myth already soaring in popularity, we’re confident that Rabcat games will become some of the most highly sought after pokies on the Web.